"Here are the Steps we took..." in Four One-Hour Sessions!! This book has created a spiritual renewal by taking newcomers and old-timers alike back to the original A.A. program that produced a 75% recovery rate from alcoholism. The first edition sold out in less than eight months. The second edition was modified based upon the experiences of the first 100 Back to Basics groups and an A.A. General Service Office review of the book.
" . . . teaching the Twelve Steps is the sole purpose of an A.A. group." The Beginners' Meetings of the 1940's really worked. "Sponsoring" newcomers through the Twelve Steps was a four-week commitment. Newcomers and "Sponsors" took all Twelve Steps together. All of the Steps (with the exception of the 5th Step) were taken during the meetings. For the Newcomer who was incapable of writing a 4th Step inventory, the Sponsor wrote it for him or her. The essential written step for the Newcomer was the 11th Step--Guidance from the God of the Newcomer's understanding. It was the "Sponsor's" responsibility to call the Newcomer during the month of sponsorship. After completing the sessions, both the Newcomer and "Sponsor" moved on to "sponsor" others through the Twelve Steps. Back to Basics is based two years of research, and more than one hundred interviews of old-timers who found lasting sobriety in the 1940's. In this book, Wally P., archivist, historian and author, will take you through the Twelve Steps as they were taken in the "original" A.A. Beginners' Meetings. You will learn how to develop a direct two-way communication with the "God of your understanding", and how to follow the "Guidance" you receive. You will have the opportunity to experience the life-changing spiritual awakening that occurs as the direct result of completing the Twelve Steps in four one-hour sessions. In addition, you will learn how to become a "life changer" by bringing the Beginners' Meetings to others. 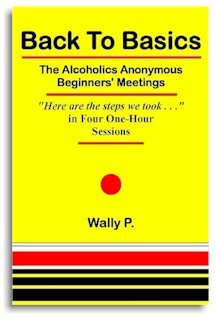 The book Back to Basics--The Alcoholics Anonymous Beginners' Meetings has been dedicated to Dr. Bob, who endorsed this meeting format. His daughter, Sue Smith-Windows, has whole-heartedly agreed that her father was an absolute believer in the "Keep It Simple" approach detailed in this book. Chapter 1 of Back to Basics is an accurate account of the history of the Four One-Hour Meetings. Chapters 2 through 5 consist of two A.A. home group members, taking newcomers through the Twelve Steps during the fall of 1946. Chapter 2 -- Session 1, Overview and Step 1. Chapter 3 -- Session 2, Steps 2, 3 and 4. Chapter 4 -- Session 3, Steps 5, 6, 7, 8 and 9. Chapter 5 -- Session 4, Steps 10, 11 and 12. Chapter 6 contains additional information on the AA program of the 1940's and "How it worked". This book shows why the Beginners' Meetings were such an integral part of A.A.'s initial success! Discover the sheer simplicity of the early AA program that produced a 50-75% recovery rate from alcoholism. Experience the spiritual awakening that occurs as the direct result of taking the Twelve Steps in four one-hour sessions. To date, more than 500,000 have been through the Back to Basics A.A. Beginners' Meetings. They have proven, beyond a shadow of doubt, that "It works--it really does." This Meeting Leader Guide is the companion for the Back to Basics book. Included are the meeting formats for the four one-hour sessions, 8 handouts (including the 4th Step inventory) for the newcomers, and "Spiritual Bullets" about the Beginners' Meetings of the 1940's. A re-enactment of two A.A. Home Group members (Wally P. and Brenda C.) taking newcomers through all Twelve Steps during four one-hour sessions. Recorded live at the Mesa House in Mesa, AZ during regularly scheduled Back to Basics A.A. Beginners' Meetings. This discount package consists of one Meeting Leader Guides (Original Format), 10 Back to Basics books and a PowerPoint 2010 presentation CD. Included are the meeting formats for the four one-hour sessions and the originals of 8 handouts (including the 4th Step inventory) that can be copied and distributed to the participants. This package also includes 10 Back to Basics books that can be used by participants to follow along as the Meeting Leader(s) conduct the four one-hour sessions. The Back to Basics-Seminar Format is the culmination of more than fifteen years of Back to Basics seminars conducted by Wally P. as one day events. Each of the hundreds of seminars he has led began at 9:30 am and by 4:30 pm everyone in attendance had completed all Twelve steps. With this format, the attendees take Steps One, Two and Three in the first session. The sessions are shorter than the 1946 Back to Basics original format and much of the historical information in the original format has been removed. The Meeting Leader Guide is available with and without a PowerPoint CD. The seminars consist of five CD s rather than four, with CD#1 being an overview of the phenomenal success of the Back to Basics recovery process throughout the world. Listen as Wally and friends take a room full of people through the Twelve Steps. These CD's were recorded live at a Back to Basics AA Seminar in Las Vegas, Nevada. During this 75 minute DVD, Wally P., noted archivist, historian and author, takes you through all Twelve Steps the way they were taken during the early days of the Twelve-Step movement. Experience the miracle of recovery as Wally demonstrates the sheer simplicity and workability of the process that has saved millions of lives throughout the past seventy years. The accompanying CD contains twenty-four pages of PDF presentation materials for facilitators and handouts for participants, plus eight pages of bonus material on the Forth Step inventory. Here is everything you need to take or take others through the Steps "quickly and often." This DVD has proven to be a life-saver for those having difficulty finding someone to take them through the Twelve Steps the way they were taken when we had a 50-75% recovery rate. Just follow the instructions on the DVD and let Wally be your "temporary sponsor." This DVD was produced at the Arizona Public Media Studios in Tucson Arizona using high definition cameras, flat screen graphics, and PowerPoint overlays. It is a state-of-the-art production that is both instructive and enlightening. This is an exact reproduction of the Sobriety Cards issued in Windsor Ontario, Canada starting in 1943. These cards are issued at Back to Basics Seminars and by Back to Basics Meeting Leaders to those who TAKE the Twelve Steps in Four One-Hour Sessions.